Although eLearning and mLearning tend to be used synonymously, the two modes of learning differ in many respects. The “e” in eLearning is “electronic.” So eLearning is any form of learning that is delivered using electronic devices like the computer via channels like the Internet. However, learning can also be delivered via the Intranet/Extranet networks. The “m” in mLearning is “mobile.” So mLearning is any form of knowledge that is given using hand-held and portable devices. Therefore, mLearning is a sub-set of eLearning because both rely on digital communication to teach, but they have many differences. 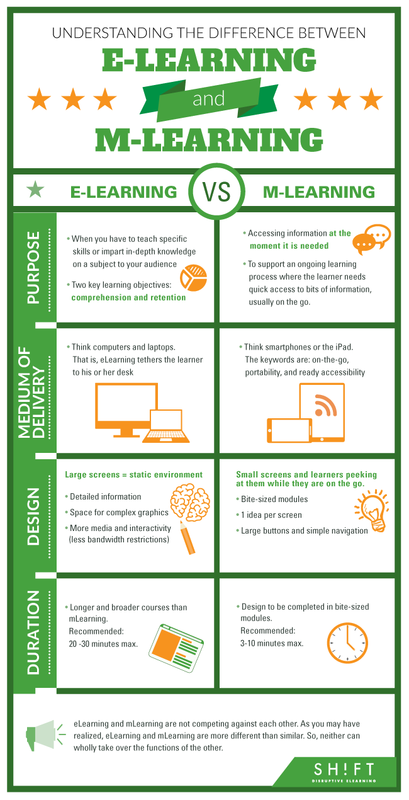 The “Understanding The Difference Between eLearning and mLearning Infographic” presents all the basic information you need to know about the two formats so that you can help your customers create effective instructional content for each.